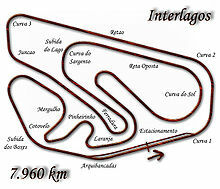 The 1976 Brazilian Grand Prix was a Formula One motor race held at Interlagos in São Paulo, Brazil on 25 January 1976. It was the opening round of the 1976 Formula One season. The race was the fifth Brazilian Grand Prix and the fourth to be held for the World Drivers' Championship. The race was held over 40 laps of the 7.87-kilometre circuit for a total race distance of 315 kilometres. The race was won by defending world champion, Niki Lauda, driving a Ferrari 312T. The Austrian driver won his eighth Formula One Grand Prix by 28 seconds over French driver Patrick Depailler in a Tyrrell 007. Second place was Depailler's best finish in almost two years having finished second previously at the 1974 Swedish Grand Prix. Tom Pryce finished third in a Shadow DN5B in his second podium in six months. It would prove to be the season highlight for Pryce and for Shadow Racing Cars. It was their only podium for the season and Pryce would not stand on the podium again. For the opening round of the season, James Hunt took pole position in his McLaren M23 with reigning champion Niki Lauda alongside in his Ferrari (which set the tone for the season). Emerson Fittipaldi qualified fifth on his debut for his brother Wilson's Copersucar team, after occupying third position for much of practice. Clay Regazzoni in the second Ferrari took the lead at the start. Lotus teammates Andretti and Peterson collided on the first lap, both retiring as a result. Regazzoni, Lauda, Hunt and Shadow's Jean-Pierre Jarier battled. Regazzoni and Jarier collided, and the former had to pit for repairs. Lauda now led from Hunt and Jarier, but Hunt crashed out due to a sticking throttle, and Jarier did the same a lap later after driving on some oil in the track. Fittipaldi's debut race for Copersucar failed to live up to its initial promise, the Brazilian double world champion ending up three laps down after various technical problems. Lauda thus started his title defence with victory, with Patrick Depailler second in the Tyrrell, and Tom Pryce completing the podium in the other Shadow. 14 cars were classified finishers, including Carlos Reutemann whose Brabham BT45 ran out of fuel with three laps to go. Emerson Fittipaldi in a Fittipaldi FD04. ^ a b "Brazilian Grand Prix". MotorSport. March 1976. Retrieved 2017-11-13. ^ Lang, Mike (1983). Grand Prix! Vol 3. Haynes Publishing Group. p. 109. ISBN 0-85429-380-9. ^ Lang, Mike (1983). Grand Prix! Vol 3. Haynes Publishing Group. p. 111. ISBN 0-85429-380-9. ^ "1976 Brazilian Grand Prix". formula1.com. Archived from the original on 10 December 2014. Retrieved 23 December 2015. ^ a b "Brazil 1976 - Championship • STATS F1". www.statsf1.com. Retrieved 13 March 2019. This page was last edited on 13 March 2019, at 15:09 (UTC).